According to the Federal Highway Administration (FHWA), there are 3,526,344 semi-trucks registered in the state of Washington, sharing the road with regular drivers every day. Due to the enormous size and weight of these vehicles, when a semi truck causes a crash with a normal car, the damage and injuries that result can be catastrophic. However, the potential for more serious damage is not the only thing that makes a truck accident different from other vehicle wrecks—everything else happens on a larger scale, too. Filing a truck accident claim is usually much more complex than usual, there are more people involved and the opposition you face from the other side may be much more daunting. Therefore, there is usually also a greater need to hire a qualified truck accident attorney who can guide you through the claims process and stand up for your rights against the trucking company. 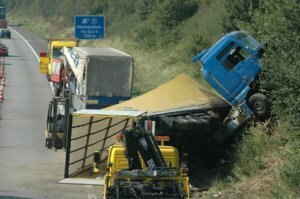 Local Washington truck accident lawyers provide general information about these unique types of wrecks. They also list some of the most dangerous roads in the state for trucking crashes. If you need assistance with a claim, then simply ask the lawyers, and we will help you set up a free consultation. What Are the Most Dangerous Roads in Washington for Truck Accidents? How Are Trucking Accidents Different from Car Crashes? Different kinds of insurance. Trucking companies are generally liable for injuries and damages that result from their own negligence or the actions of their employees. Therefore, truck accident victims may be able to file a claim with trucking company’s insurance provider. This kind of policy may have higher limits than a normal car insurance policy. However, when you file a trucking accident claim, you may have to deal with the company and its lawyers in addition to the insurance adjuster. Additional laws and regulations. The trucking industry is subject to federal regulations as well as state-specific traffic laws. In some cases, demonstrating that a company or driver violated certain regulations can help support your claim. Different common causes. Some common contributing factors to truck accidents do not apply to regular car crashes. For example, brake failure due to lack of routine maintenance is a possible truck crash cause. However, commercial truck braking systems operate entirely differently from those in passenger cars. Larger recovery. Usually, truck accident claims involve more serious injuries and damages from other cases. Therefore, the settlement or verdict is usually larger as well. Need for an attorney who has experience specifically with truck wrecks. Most ordinary citizens are not familiar with the complexities of the trucking industry, federal regulations or the mechanical makeup of big rigs. Therefore, hiring a lawyer who does understand these things is crucial to recovering the full compensation you deserve. What Are Federal Trucking Regulations? Hours of service limits. FMCSA regulations limit how long commercial truck drivers may stay on the road and on the clock each day. These limits are intended to prevent drowsy driving, which significantly increases the risk of an accident. To enforce these limits, trucks have electronic logging devices that record how long a driver spends behind the wheel. However, trucking companies may pressure drivers to exceed these limits, either explicitly or implicitly with unrealistic deadlines and penalties. Medical exams. New truck drivers must complete a DOT medical examination, which determines the individual’s physical fitness to drive a truck. Medical conditions like diabetes, sleep apnea and alcoholism may disqualify an applicant. Drug tests. Trucking companies must administer a drug test to all new employees, according to FMCSA rules. In some cases, drivers may also have to take a drug test after a crash or traffic citation. Texting and driving. Federal trucking regulations forbid commercial drivers from texting or using their phones to do anything other than place or accept a call while behind the wheel. Additionally, each state has its own distracted driving laws, which drivers must obey. In Washington, all cell phone other than hands-free systems are banned. Truck maintenance and checks. A trucking company must ensure that all its vehicles undergo regular maintenance and safety checks. Additionally, companies must train drivers to properly check and secure cargo to prevent crashes caused by shifting loads. A truck accident lawyer can investigate your crash and collect evidence from the trucking company to identify any federal regulation violations. If so, then this evidence can help prove liability, supporting your claim. If you need more information or have a question about truck accidents, then simply ask the lawyers. Otherwise, consult our local listings to find a lawyer in your area.